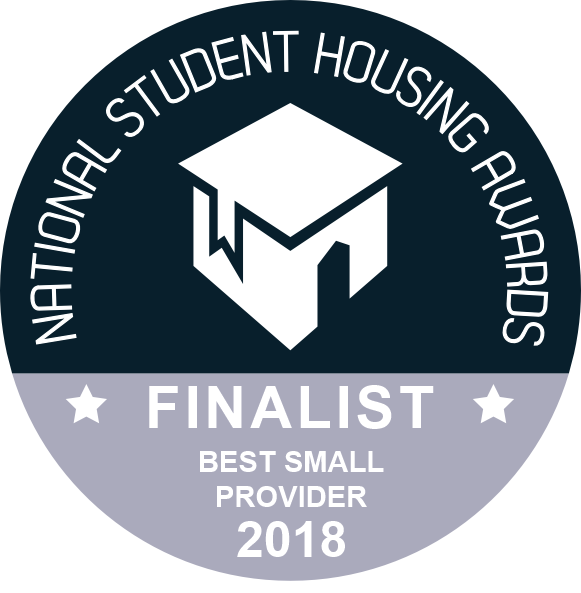 CODE Student Accommodation are delighted to announce once again they are finalists for the Best Student Accommodation Provider in the UK in the prestigious National Student Housing Survey 2018 and hoping to repeat their success of 2016 and 2017. The National Student Housing Survey is unique as it directly asks over 30,000 students, from over 200 universities and colleges, for their experiences over a broad range of questions about their student accommodation and compiles this data to feedback to Student Accommodation providers and enables each provider to benchmark their performance against those in the same industry and area. The data is used by CODE to ensure each aspect of the accommodation offering is continuously improved and underlines the scale of the achievement for CODE whose success not only represents the superior quality of the accommodation and facilities on offer but as importantly the high level of customer service available either face to face, over the phone or increasing remotely over the internet where students are comfortable to engage using all forms of social media. This comes hot on the heels of the success of winning the UK Customer Satisfaction Awards 2018, ran by the Institute of Customer Service, making sure that CODE Leicester is offering the very best support for students health and wellbeing, alongside the finest student accommodation available, to attract the widest range of students from home and abroad. In an increasingly competitive and growing market CODE understand and embrace that students are not only looking for great facilities such as a Gym, Café, Cinema, Dance Studios and Fitness Classes but also a well-managed student community where there is a widespread right to quiet, on hand 24 hour security and a highly skilled and experienced Team on hand to support them at University.